These films center around the mid-20 century perception of General Motors. You see their factories, their workers, their activities during WWII, and what they perceive as the future as well. Fascinating look at one of the most historic car companies in world. 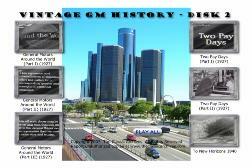 Historic GM History Film Collection, 2 DVD set! Although General Motors has been having some problems of late, it wasn't long ago that they were more than just a car company, they were a symbol of the American Dream. Grow up, go get a job at a company like General Motors, and you're set for life. These films center around the mid-20 century perception of General Motors. You see their factories, their workers, their activities during WWII, and what they perceive as the future as well. Fascinating look at one of the most historic car companies in world history. Makes a great gift for anyone with a classic GM car. General Motors 1961 Motorama film presenting new cars, appliances and futuristic ideas. This institutional film was designed to promote Chevrolet's corporate citizenship rather than any specific model of automobile. While it forcefully demonstrates how central automobile manufacturing is to the American economy, it even more strikingly shows the effects of the automobile upon our landscape. Bombastic narration is accompanied by excellent images of automobile manufacturing, the extraction and processing of raw materials from the earth, and mid-1950s consumerism. Cinematography: Gordon Avil, Pierre Mols and Robert Tavernier. Music: Samuel Benavie. Narrator: John Forsythe. Revised from the original 1951 version. Imaginative cartoon that breaks down the parts and features of a Chevrolet automobile into units that can be understood in terms of plant and animal life: caterpillars roll into circles and become automobile tires; in the "visible V-6" fireflies equal spark plugs and mice provide motive power. Naturally, tells part of the Cinderella story, too. Animation supervisor thought to be Frank Goldman. Discusses GM's effort towards WWII. There is a celebration of their 100,000th Detroit diesel engine, and a look at their war machinery around 1944. Definitive document of pre-World War II futuristic utopian thinking, as envisioned by General Motors. Documents the "Futurama" exhibit in GM's "Highways and Horizons" pavilion at the 1939 World's Fair, which looks ahead to the "wonder world of 1960." Motivational film for 1920s Chevrolet salesmen.